Andean Nation is devoted to the promotion of Andean folk music. Our website contains useful information for people interested in learning more about the history and background of this unique musical genre. After more than 20 years of performing and recording, we have a number of CDs available through our Online Store, everything from traditional Andean music, to our much acclaimed Christmas CD’s, Songs of Winter and Songs of Winter Volume II. We now have song samples for you to listen to as well. For the aspiring musician we have high quality Bamboo Kenas & Hardwood Kenas in the key of G, Bamboo Kenachos & Hardwood Kenachos in the key of D. These end-blown, notched flutes are imported from Cochabamba, Bolivia. 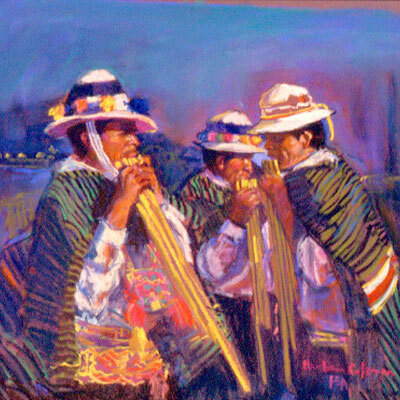 The Sikus (Andean “Pan-Pipes) are standard in the key of G and come in three basic sizes: Chuli (soprano), Malta (tenor) and Sanka (baritone). There are sound samples for all the instruments, and feel free to email me if you have any questions. Remember, we have our popular instruction manuals, Learn to Play the Kena and Learn to Play the Siku, to get you started on the path to self-instruction. If you are a string instrument player, you may want to take a close look at our Bolivian Charangos, made in Cochabamba. For special orders, I can get you any instrument you might be interested in, check out our Instruments section and see what’s new: Toyos, Rondadors, Ebony Kenas, and Kenas in a multitude of keys. I hope you find what your looking for!